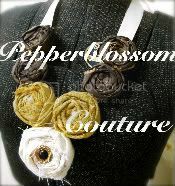 pepperblossom decor: Featured Tomorrow... Dont Miss It! not only do they provide quality products but each creation is unique and made from the heart! Don't forget to enter to win midnight tickets to New Moon!